I’m going to show you how to make walking tacos! These are “tacos” that you eat in a bag instead of tortillas. 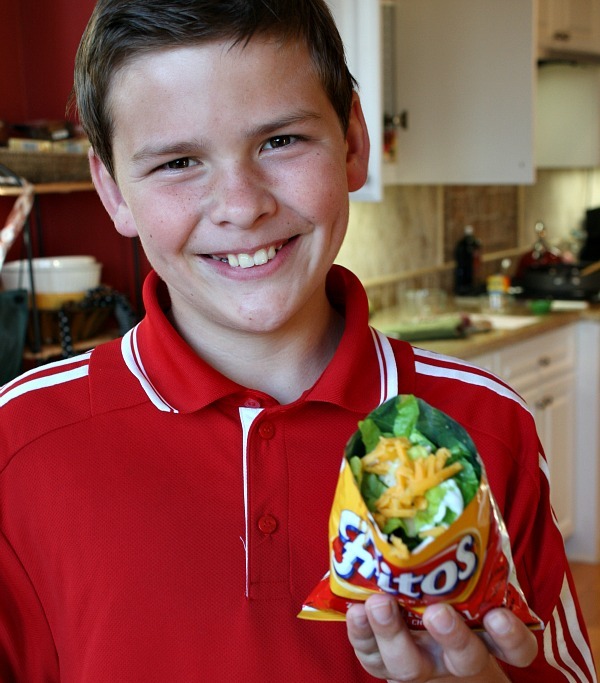 All of the great taco fillings are added to a bag of Fritos! 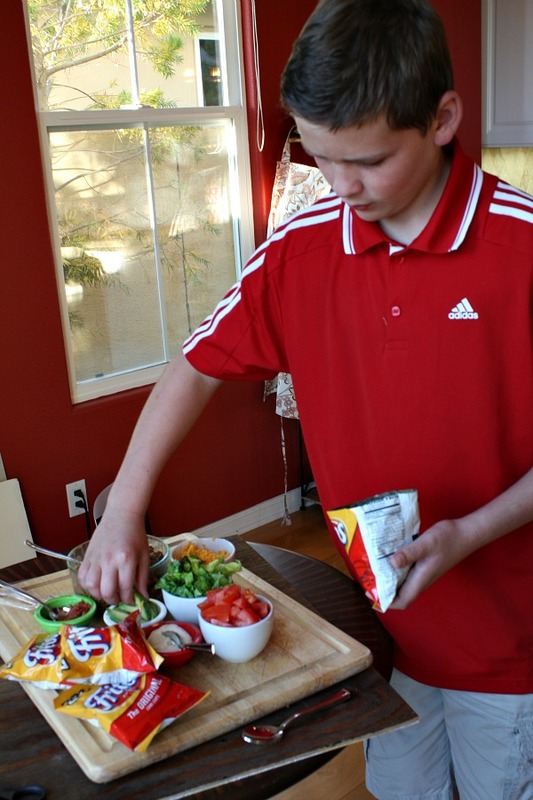 Watch the video showing you how to make walking tacos, then scroll to the bottom and print out the recipe so you can make them at home! Have you ever had Fritos before? I bet some people have eaten them or have at least heard of them. My Dad is one of those people. 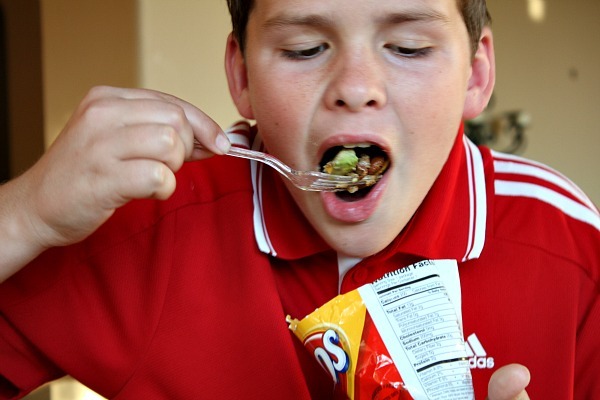 His favorite chips are Fritos and his answer is always the same at Subway. I’ll have blah blah blah with blah blah blah and a bag of Fritos. 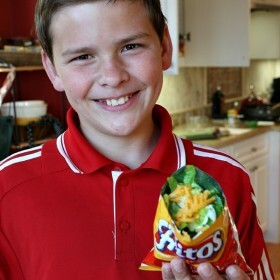 I also love this particular chip but not as much as the Frito Fanatic, my dad. This last week, I decided to make something that he would enjoy, Walking Tacos. Too bad for him though because I made this yummy recipe on a day that he was on a trip. They are delish. I need a fork NOW!! First you need to prepare the taco filling. 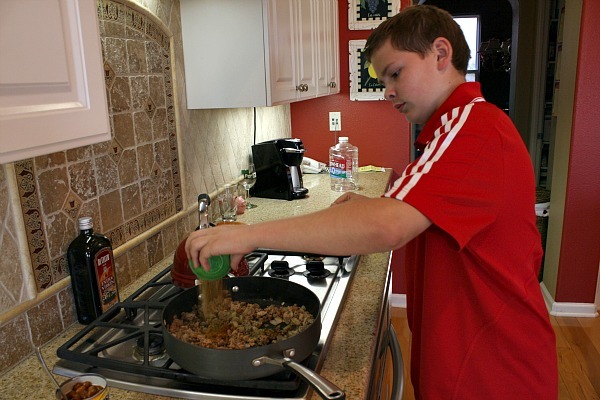 Saute the onions, then add the meat, and finally add the spices and beans. 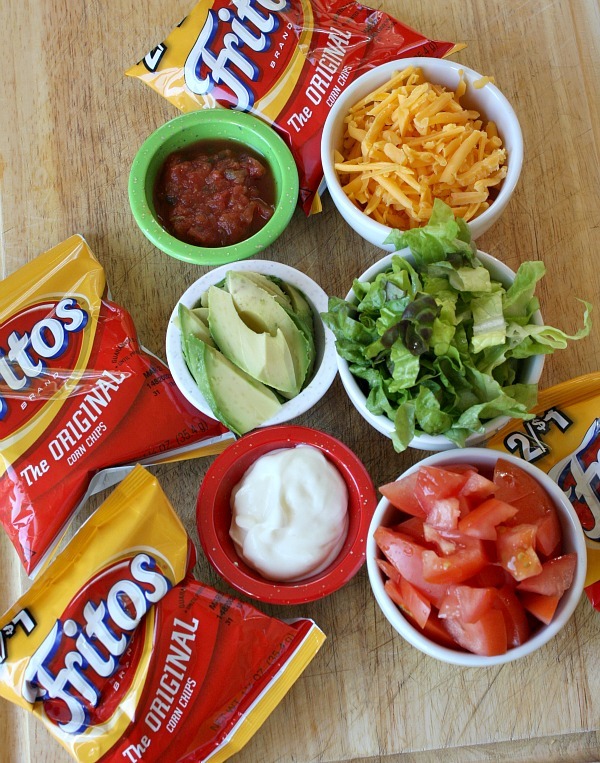 Here are the rest of the things you need to make Walking Tacos. I don’t like tomatoes and some kinds of salsa so I avoided those two items myself. Gosh! 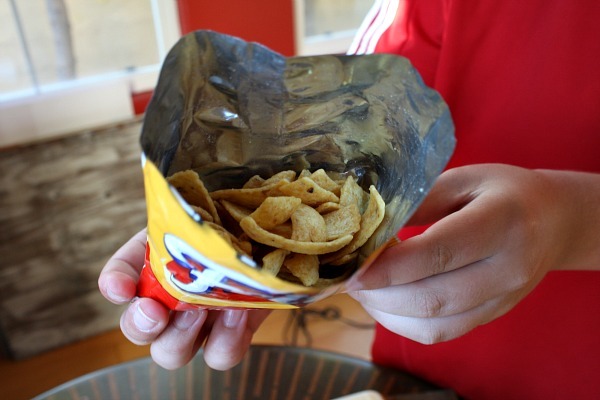 The Fritos Company hardly puts any chips in the bag. What a rip-off… or so you think. It’s actually good to have a small amount of chips in the bag that way you can load up the rest of your bag with meat and other yummy stuff. Once the meat comes off the stove, you can put some of it in the bag. At this point, it’s already in the bag (No pun intended). Now it’s time to load up the meat and Frito filled bag with the other “yummy stuff” that I mentioned earlier. Whose mouth would not water at the sight of that modified bag of Fritos? Final step: Eat your miraculous creation. Then just toss the bag when you’re done- no mess! This Super Bowl festive recipe turned out great and every football-watcher dad (and everyone else too!) will LOVE these. YUM!! I would like to thank Jenny at Picky Palate for sharing how to make Walking Tacos, and I hopefully will be able to make this for my dad when he is in town sometime later. 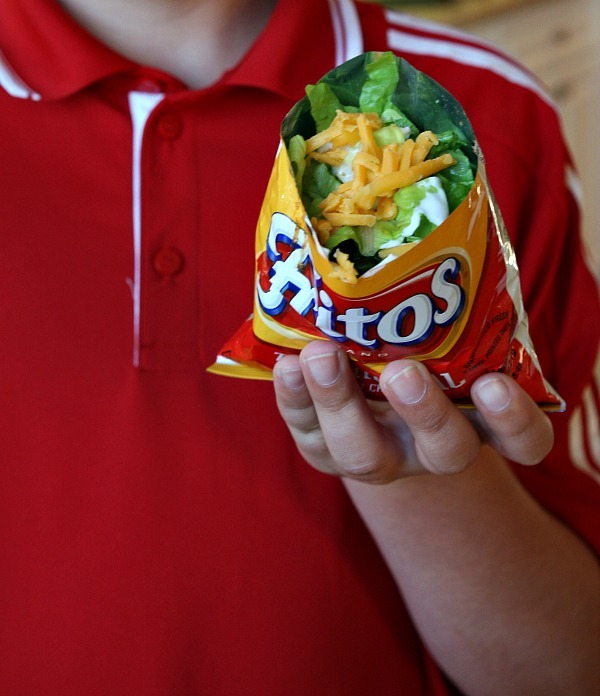 And even a kid can turn bags of Fritos into Walking Tacos…. Like Me! Awesome recipe for a Super Bowl party! Heat a large saute pan to medium-high, swirl a Tablespoon of olive oil. Saute onions and mix in ground meats. Cook until lightly browned. Tilt the pan and scoop out any accumulated fat (or take a bunch of paper towels and let them soak it up. Discard the fat. Mix dry ingredients in a small bowl. Sprinkle mixed spices onto the cooked meat. Pour in chili beans. Heat for about 10 more minutes, and your taco filling is ready. 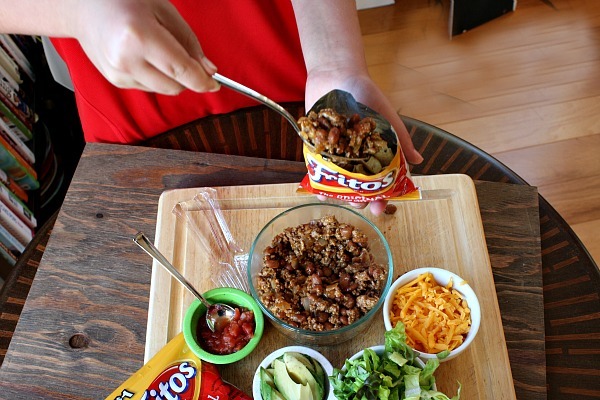 Set up a "fixings" table with a bowl of the taco meat and desired taco fillings, and let each person fill their Fritos bag with whatever fixings they'd like. I love it. Good job and thanks for sharing. Love Walking Tacos! they look great! I’ve never had Walking Tacos before, but I’ve always wanted to try! They sound delicious! These are served at every Little League concession stand since I was a girl. Except we call them Frito Chili Pie. You cut the bag on the side so it opens up more then add Chili, cheese, and onions if you like. we do this with chili and cheese and make frito pie. I’m going to try the walking tacos next week. Brooks, you (and your mom) make such wonderful things! Husband, Bud, says he’s going to make those Walking Tacos! Thanks for your recipe! I’ve wanted to try these for so long! I’m like your dad, a sucker for Fritos. So salty and delicious, the perfect snack food! I love walking tacos but have never made them myself. Now I must! i love your sweet lil posts. my older son loves to cook! he’s pretty good at it too. i will def share this recipe w/him. we try to eat as healthy as possible bc we are all a bit hefty. i’m thinking we could do this w/100 cal dorito bags. maybe omit the meat and just use beans, lettuce, salsa and fat free sour cream. YUM! I’ve never had a walking taco. 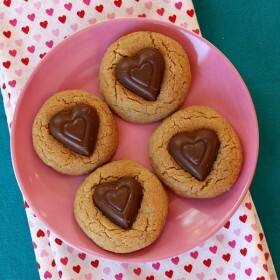 Guess I better go on a walk so I can enjoy one:) Enjoy the big game! What a great idea, I can’t wait to show my kids, they’ll love it!! This is new to me. Didn’t have these when Uncle Bruce was growing up. Otherwise they would have been a popular item in our kitchen for the Superbowl or any other day! You have the best sense of humor. This looks like a great treat. Yum. YUM! My family and I make these too but we do it with Nacho Cheese or Cooler Ranch Doritos 🙂 never tried it with Frito’s but I’m sure that would be delish too! Colin & I think these look yummy ! Will try it soon. Wow! What a fun idea! I can’t believe I’ve never heard of this. My family will love it tonight. Thanks!!! These look like they’d be great for camping! No dishes!!! I will try these for sure. These aren’t so new. We had them at our high school and local fair in the 60s, but they were called Pepper Bellies! They are good no matter what they are called and now you can make them with tortilla chips. We sometimes do the same thing on a plate. Same ingredients, just more of them! My boys gobble these up! !